The skull, which dates from 945 A.D. to 1308 A.D., was discovered accidentally while digging an irrigation system in the northwest state of Sonora in Mexico. 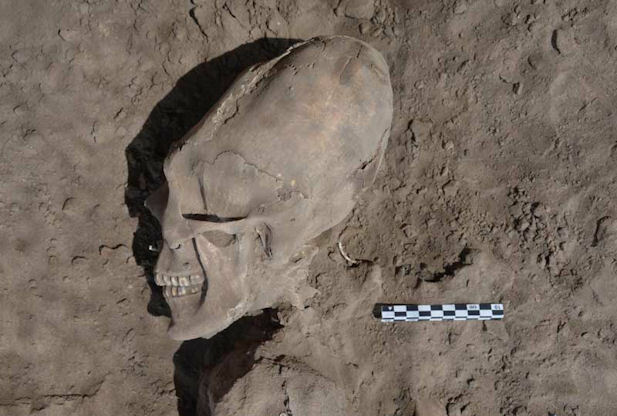 Cristina Garcia Moreno, who worked on the project with Arizona State University, explained that 13 of the 25 skulls found in the Hispanic cemetery had these deformed heads. “We don´t know why this population specifically deformed their heads,” Moreno told ABC News. The site, known as El Cementerio, was discovered in 1999, but the team just completed their analysis of the skeletal remains last month. They plan to continue their research during the next field season. Archaeologists also discovered artifacts on the site, like pendants, nose rings and jewelry. The Chinook of the U.S. Northwest and the Choctaw of the U.S. Southeast both were known for practicing skull deformation as well.